And now on to a new daily photograph. What's going on in the picture below? YOU tell us! 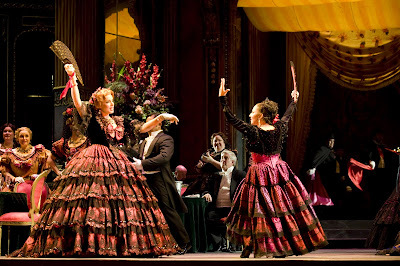 Submit your witty, clever, and creative captions in the comments for a chance to win a La Traviata poster. Enjoy! I told you this fan flair was a great upper arm workout. Don't you agree? Get off my stage, damned understudy! My deodorant is better than yours - I can raise both arms!